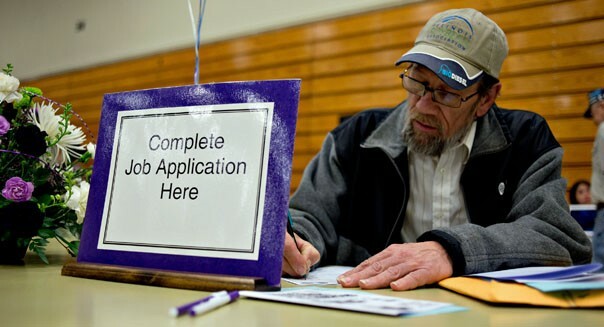 U.S. private-sector hiring slowed again in April as companies added the fewest employees in seven months, the latest sign the economy is encountering a soft patch, a report by a payrolls processor showed on Wednesday. Businesses added 119,000 employees to their payrolls last month, according to the ADP National Employment Report, falling short of economist expectations for a gain of 150,000 jobs. It was the smallest gain since last September. March's private payrolls were revised down to an increase of 131,000 from the previously reported 158,000. U.S. stock futures were little changed immediately following the data, while the euro extended gains against the dollar and Treasury securities firmed. "This put a downward bias on expectations on Friday's payroll number," said Sam Bullard, senior economist at Wells Fargo in Charlotte, N.C.
Friday's report is expected to show overall nonfarm payrolls increased by 145,000, an improvement over the paltry 88,000 seen in March. Economists sometimes tweak their payrolls forecasts following the ADP report, though the private sector report doesn't always accurately predict the government figures. Nationally, the average gas price hit a recent high of $3.74 per gallon, nearly $0.50 higher than it was on Jan. 1. According to website GasBuddy.com, that's about a 14 percent increase since the start of the year. The start of the new year also marked the end of the temporary 2 percentage point tax break on Social Security contributions. Once that part of President Obama's stimulus package expired, your paychecks went back to being 2 percent smaller. For the average family, that adds up to about $1,000 a year. That same "average family," by the way, already earns only about $50,000 a year today. And according to CNN, that's about $4,000 less than you were earning in 2000. A disconcerting report from Sallie Mae last week showed that about one-third of Americans working toward retirement are having to raid their retirement savings to pay for their kids' college educations. According to a poll commissioned by Bankrate.com (RATE) in February, only 55 percent of Americans have enough money tucked away in their savings accounts and "emergency funds" to cover the amounts owed on their credit cards. That Bankrate poll also revealed that among women in particular, 51 percent actually owe more on their credit cards than they have cash in the bank. Digging deeper into the data, Bankrate reported that while high earners are doing well, and generally flush, most people (59 percent) who earn less than $30,000 annually owe more on their cards than they have in savings. And these are the people least able to afford the high cost of credit card interest. Speaking of earnings -- and jobs -- the same unemployment report that set Wall Street to cheering Friday can be looked at from a glass half empty perspective as well. The new, lower unemployment level of 7.7 percent is the best number we've seen since the Great Recession ended. However, The Wall Street Journal points out that 7.7 percent is very close to the worst unemployment ever got (7.8 percent) in the 1991 recession. Our best number in years is within a whisker of the worst they faced back then. The overall workforce participation rate -- the percentage of Americans currently earning wages at all -- currently stands at just 63.5 percent. According to the Bureau of Labor Statistics, that's much worse than what we saw in the 1991 recession. It's the lowest we've seen since the recession that hit during the Carter administration. Little wonder, then, that according to the Bankrate survey, people are increasingly concerned about "job security." Friday's unemployment report may suggest that the jobs market is on the mend, but most people (59 percent) say they feel no more or less confident in their employment situation today than they did a year ago. Among those polled whose opinions have changed, 23 percent said they feel "less secure today" than they did a year ago, versus 19 percent who feel more secure. That doesn't exactly jibe with the story that things are getting better. It's great news for folks who own stocks, no doubt, and according to the Journal , more than 90 percent of people earning $100,000 or more do. But what about the rest of us? Fewer than 46 percent of Americans earning less than $50,000 are invested in the stock market -- and remember, "$50,000" is the average income in America today. So yes, It turns out for the average American, things may not be getting better at all.